The Camera That Conked Out! | To Be, To Be. Tutubi. 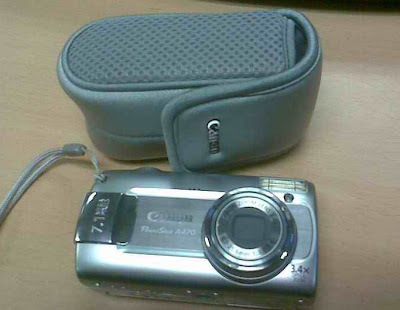 Remember the camera that I bought last June 2009 from the money I received from blogging? The lens was damaged when we went to Boracay last July. What was so weird about it was that the camera I borrowed from a friend who works in Boracay also developed the same problem. I had my camera repaired last July, then returned it for repair again after two months and then again after one more month. The last time that we used it during my daughter's Christmas party, it conked out again! I bought a new camera last year already because I consider a camera tools of my trade, but I am still paying for it, interest-free. So my dilemna is what to to with this camera that conked out. I paid P1,200 for the repair, and P100 for every back-job request. The only good about going back to the repair shop is that they offer great photobooks that I buy everytime I am there. But I really cant keep on going back to the repair man everytime it conks out. I was told that the cost of replacing the lens was P2500 and I can already buy a new camera at that price so I just opted for the repair. But I guess I should have paid the higher price that suffer this! The other camera that got damaged will be sent to me this week for repair and I was thinking if I should just have the lens replaced at a higher cost. What to do?